"I dislike arguments of any kind. They are always vulgar, and often convincing." Over the years I have written in many different arenas and have found the diversity to be stimulating. I have written about occupational safety for General Motors, database training for an airline, AIDS awareness for a school system, public relations media for a botanical garden, websites for an organic food company... I have not yet found any material to be so technical or inaccessible that I have not been able to work with it to render it accessible to others. I continue to take pride in the art of crafting words to enhance communication. My professional background is documented in detail below. 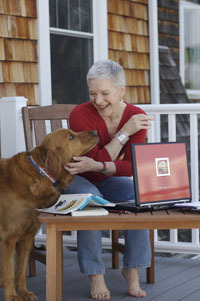 ~ Rhode Island Editor & Writer, People, Places & Plants Northeast garden magazine. ~ Managing Producer & Writer, Interactive Training Systems, Cambridge, MA. ~ Producer & Writer, Digital Equipment Corporation, Bedford, MA.